With the weather hitting the high 80s here at the farm, there’s no shortage of critters hogging all the shady spots. 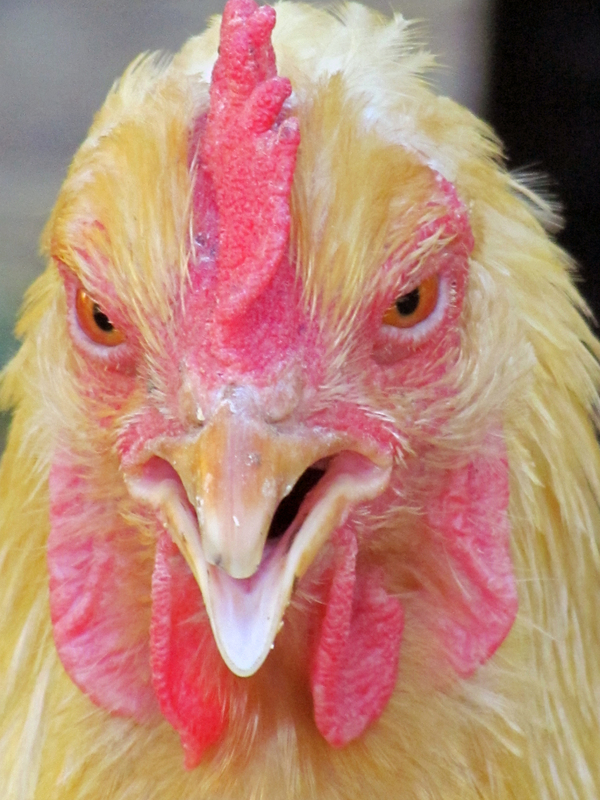 The chickens sit around with their beaks gaping open and their wings curved out to the side, generally looking vexed and occasionally emitting an indignant squawk at nothing in particular. Most of them hang out in the shade under the deck, braving the heat only when I come outside to dispense watermelon and other tasty treats. I dislike hot weather for several reasons, the first being it’s not particularly wise to wear shorts around animals. Dimsworth and Hawthorne like to investigate anything that’s a bright color with their beaks, and are particularly drawn to anything blindingly white, such as my legs. So even though jeans don’t play well with hot weather, I’m stuck with them. I spend the hottest part of every afternoon scampering around outside, making sure everyone has clean, fresh water to drink. Goats are notorious for refusing to drink dirty water; they would prefer to fall over from dehydration rather than lower their standards. Since we have ducks, I have to change the water buckets a couple times a day since no matter how high I hang the bucket, a duck will find a way to dump dirt in it. 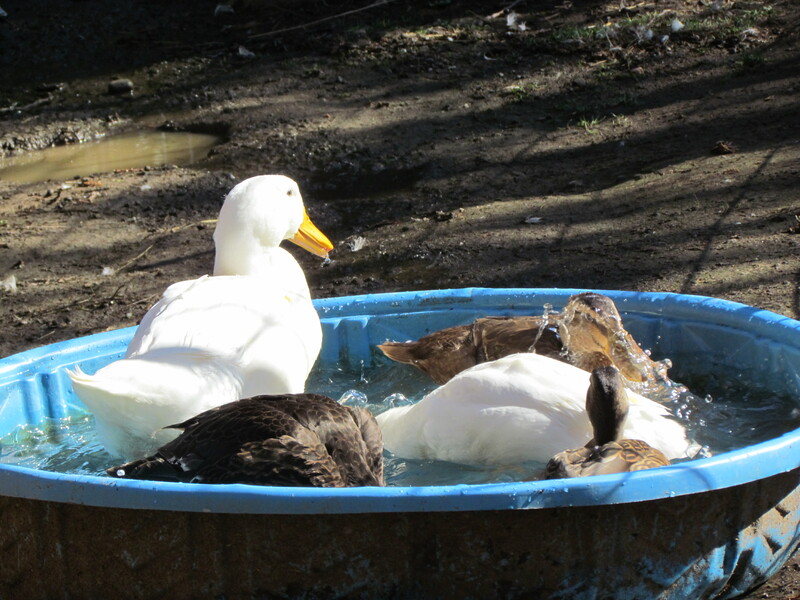 The ducks love nothing better than playing in a freshly refilled pool, and usually don’t even wait until I’ve taken the hose out of it to pile in. I can’t stay irked at them for long when they’re splashing and cavorting in the clean water, having the time of their lives. A few times I’ve been tempted to climb in there with them, but they have a bad habit of dropping bombs in the pool, and that’s just not okay. Harvey and Cinnabun don’t mind the heat overly much, mostly because they choose to spend the sweltering afternoons happily munching their way through my garden. My shady and tasty garden. So far they’ve eaten my entire bok choy crop, and are quickly working their way through the chards and celery. They even have the gall to chitter at me when I “accidentally” spray them with the hose as I water the garden. 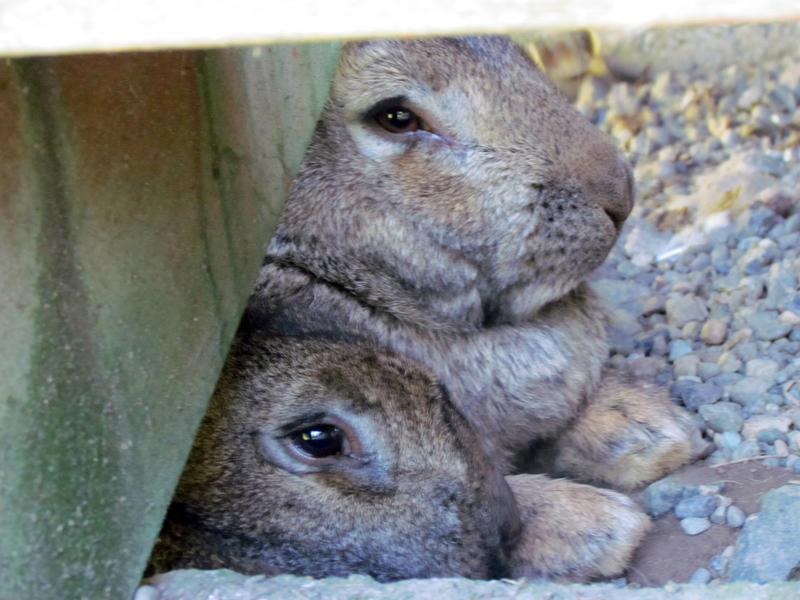 When they’re not being Bunnies of Destruction, they also spend their time in the shade underneath the deck. One of the things I love most about them is that no matter how hot it is outside, they still want to cuddle up together.